Why NewEar Digital Hearing Amplifier is an ideal choice? NewEar brings you the most stylish digital hearing aid that comes with a golden receiver. The device is completely digitalized, with digital circuitry and volume control. It looks more like a Bluetooth speaker than a hearing amplifier. 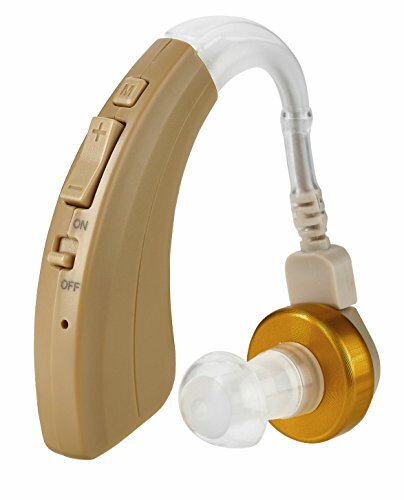 This device is unique and superior to all other hearing aids with similar functions. From the leader in hearing protection and sound amplification, this hearing amplifier is an optimal tool for those who need precision amplification. It allows the user to modify tone and volume for best results. Also, it prevents unnecessary noise and enhances sound clarity for better hearing. The NewEar hearing amplifier is lightweight and small in size. It can be used in either ear. For convenience, the device comes with three earplugs of different sizes. It's perfect for individuals of all ages. You can profoundly rely on this unit as it consumes very low power and has a rugged construction that is strong enough to last for a lifetime. We are offering this beautiful and highly digitalized hearing amplifier at a discounted rate only for a short period of time. So grab your NewEar hearing amplifier now before it runs out. Take full advantage of the wonderful offer today by just clicking the Add to Cart button above. DIGITAL HEARING AMPLIFIER: NewEar Digital amplifier is the best solution for people with a hearing condition. The device has full digital circuitry and a digital volume control for convenience. SUPERIOR DESIGN: Our hearing amplifier is designed by an audiologist. It has been innovated keeping in mind the hearing requirements and limits of an individual. The device has sleek and stylish built, and comes with a very attractive golden receiver. COMFORTABLE: The amplifier is comfortable in either of the ears. It has a full digital tone quality for low audio distortion and clearer voice. It also has a noise reduction feature that helps the user hear with maximum clarity. EXCEPTIONAL FUNCTIONS: This hearing amplifier comes with low power consumption for up to 6 times power saving over analog models. It's superior to other hearing amplifiers in the same range. Its digital volume and mode controls enhances this already top model. EASY USE AND GOOD BATTERY LIFE: Our device is simple and user-friendly. It runs on 3LR44 battery and consumes very little power, literally lowering the lifetime expenses on battery in the long run. If you have any questions about this product by NewEar, contact us by completing and submitting the form below. If you are looking for a specif part number, please include it with your message.